Jim Allen has long been four-wheelers’ most respected and reliable guide. This new edition of Allen’s bestselling Four-Wheeler’s Bible includes all the basics for getting the most out of your four-wheeler, along with updates on new vehicles, projects, events, and opportunities. The book begins with basic modifications–such as increasing ground clearance and traction with larger wheels and tires–then gathers speed for more advanced and radical mods, from installing lift kits to increasing suspension articulation. Step-by-step photo sequences guide you through whatever modifications suit your vehicles and your needs. 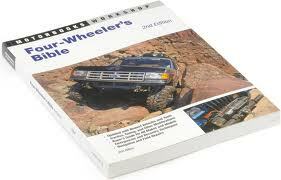 Four-Wheeler’s Bible is a resource no four-wheeler will want to be without. This entry was posted in 4x4, デザートダイレクトサービス, 雑誌 • マガジン by Mac Uchida. Bookmark the permalink.